Goodyear is the World's Largest Tire Company. With just 13 employees, Goodyear production began on November 21, 1898, with a product line of bicycle and carriage tires, horseshoe pads and — fitting the gamble Seiberling was making — poker chips. The first recorded payroll amounted to $217.86 based on the prevailing wage of 13 to 25 cents an hour for a 10-hour day. After the first full month of business, sales amounted to $8,246. Since the first bicycle tire in 1898, Goodyear pedaled its way toward becoming the world’s largest tire company, a title it earned in 1916 when it adopted the slogan “More people ride on Goodyear tires than on any other kind,” becoming the world’s largest rubber company in 1926. 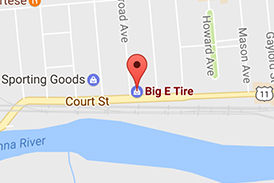 Get A Quote Today on Goodyear Tires at Big E Tire and Auto – Browse Goodyear Tires Now!